The strong sense of community is the backbone of the Rock On! Foundation and has always been important to Dylan’s family. Since Dylan’s diagnosis, the outpouring of love and support from the community has been overwhelming. As a local business, and a vital part of our community, we hope you will consider sponsoring this event. We look forward to bringing everyone together on this day to celebrate this beautiful boy, his family and his friends. Whether you are a long standing business, or just getting on your feet, this is a perfect opportunity to get your company's name out there. Every year, rain or shine, hundreds of people flood the park and the streets of Hopatcong! 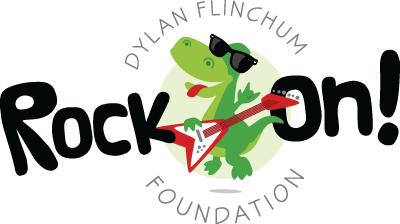 If you would like to be a sponsor for Dylan's Dinosaur Stomp, please see the information below for Sponsor Tier levels and submit your payment below. If you would like to pay by check, please download the form and submit to the address given. Prefer to mail in your sponsorship information? Download the form here and mail it to the address on the form. Sponsors are invited to attend! If you are available to attend the event, please do! We would love for you to be a part of this very special day! We appreciate your time and consideration and hope you are able to participate in this great event for a great cause. Please keep Dylan and his family in your thoughts and prayers. We thank you in advance for helping to make this year's event another great success! ROCK ON!